This material may seem messy or leaping - because she touched different themes in the same contact - and remember those are only summaries. They could transfer on a hypnosis-like way - every language in 21days. then 9 days for training. 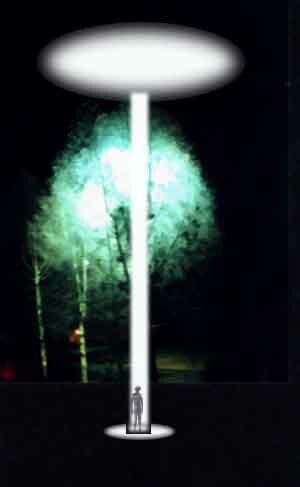 Oddly enough, they don't call their ships UFO's and the word Beamship comes from the concept of the 1St drive system light emitting device. The ships are equipped with two drive systems. One for speeds up to the speed of light and another for above the speed of light. The trip from Erra takes seven hours. It takes three and one half hours to attain the speed of light. Then there is a jump through what is called null-time, and then another three and one half hours to enter into the atmosphere of Earth. Their suits create the same effect as the protection girdle on the ships. They are worn outside the ship when on hostile planets. To make the jump in hyper-space a dilation of time is caused. The theory of relativity goes only to a certain point here. At the exact moment of the dilation of time the breaking open of the hyper-space occurs. As the ship approaches light speed, the screens are dropped which allows the enlargement of the mass which becomes a catalyst in a process which facilitates the changing of the matter of the ship into what they call fine matter. The ship then moves into what we call hyper-space (they call it null-time) and then three and one half hours to slow down and fly into our own system. They must be 153 million kilometers away from the nearest planetary body or solar system in order to make the jump into hyper-space. 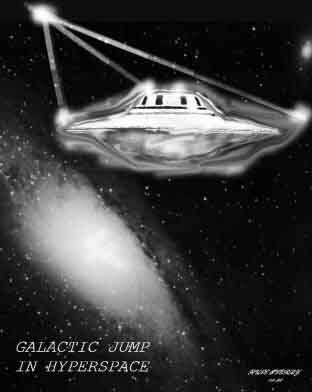 "hyperspace-jump" - when all the "pfysical mass" is elevated to a higher frequency - where the people onboard is then on the "astral-frequenzy" or higher. The shape of the ship is for the least resistance in an atmosphere and provides the largest surface area to enable the drive systems to be the most effective. The ships are protected by a beam-protection-girdle (force field) that allows the atmosphere to glide away instead of pushing against it. This is important so as not create resistance. The protection girdle also neutralizes the attractive force of our planet. They are, in a sense, diverting gravity. The ship then acts as a planet itself with its own gravity. Billy says there is no feeling of movement inside the ship. It seems to create its own specific gravity. At that exact moment the ship and all its matter is converted to finematter enabling the passage into null-time or hyper-space, there is no feeling either. It is the attainment of the speed of light which enables the process of conversion but it is not the only consideration. The mass of an object increases in relation to the speed. The ships are protected from this by screens. When the screens are dropped it enables the essential distortion and the creation of a dematerialization. Space and time are then paralyzed as the ship rematerializes at its destination. The whole process takes no more than a millionth part of a second. Most races experience difficulty with this process. When a ship breaks lightspeed without changing into null-time or hyper-space a catastrophe occurs for both ship and crew. Many of our forefathers have had to fight these same problems and have been misplaced in time. Many time travelers are stuck here on Earth. A single second in the time-spacelessness equals millions of years. The dangers of speed are great and their effects occur at even a few kilometers per hour. Even in our airplanes we are increasing mass and dissolving matter but because of the slow speed the effects take a long time, possibly hundreds of years. At high speeds it is reduced to decades or even a few years. The thought patterns of the travelers are affected. Beamships are seven meters in diameter carrying a crew of three and have interplanetary capabilities. They weigh 1.5 tons. Some of the ships have time travel capabilities. Billy noticed on his first encounter how the screens around the ship seem to distort all that is around it. The trees and all the surroundings seemed to bend. The bottom of the ship was blue in color and seemed to distort like a washboard. The energy of the ship goes out the bottom of the ship and is reclaimed at the top. The engines are an implosion device instead of explosion. Matter is converted back into something useful. Pictures of the ship are only possible when they allow it. The screens of the ships can also control the line of vision. The antennae guide beam on top of the ships attract energies and can also detect some invisible energies from Saturn which would affect our thoughts for months. This strange energy from Saturn also causes the magnetic energy of the ship to be visible for a few months. The inside of the ship has three seats which fold into sleeping couches. Most of the console of the ship is taken up with different kinds of screens which Billy took pictures of on many occasions. There is a greenish yellow light inside the ship which is generated by the board windows which are orange to the outside. These board windows also control the ability to leave the ship. If the atmosphere outside is hostile, the windows will not allow the 'pit' of the ship to open without the person wearing protective clothing. 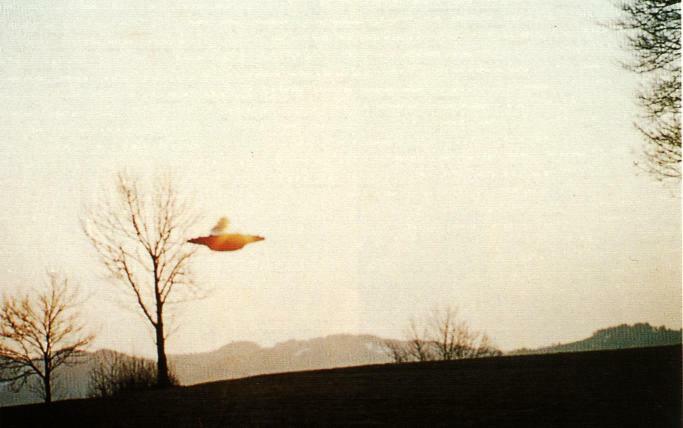 As the ship leaves the atmosphere, the color of the board windows become clear and Billy could take pictures. There are many different types of screens for the information about flight, planets and life forms. The screens can be telepathically controlled as many of the functions of the ship can. These screens can also display the birth and life span, including the time of death, of a life form as well as a color display showing the psychic information of a life form. -is from a process of conversion from lead. The soft metal is a combination of materials from lead contained in atmospheres of stars, from waters, from different plants etc. as well as different ores from stars in destruction. They then convert the lead substances they have assembled in this soft metal lead, treat it with chemicals to make it hard and still it must undergo another process, which they are not allowed to disclose, in order to make the metal suitable for Beamships. The final product is an alloy. The alloy is basically a copper-nickel-silver-alloy which also contains gold for certain Beamships. We could produce the alloy on Earth but it would be missing some of the unusual ingredients. Throughout the universe there exists all the same metals. We have most of them on Earth, yet not all. Even though we could produce the alloy from our known metals it would not be the same. We must first develop space travel in order to get to outer space to find some of the components. Billy was provided with a sample of ruby, a piece of malachite and fluorite. The crystals were a gift to Billy which he could sell if he chose. Three pieces of metal were given to Billy that represent the 3rd, 4th and 5th steps of a seven step process in making the metal. 1st phase: Absorb the lead substances from the atmosphere and condense them into pure lead. 2nd phase: Extract all dangerous radiation's form the lead. 3rd phase: Use a heat process which converts the lead into alloy. 4th, 5th and 6th phases: Different processes of heat to create the final alloy. Water is used to cool the alloy. The ships are then built with a process similar to our welding but more sophisticated. The process liquefies the metal in a cold state and lets it flow into another making it complete without suture forming one single piece. Marcel Vogel of IBM and a specialist from Europe tested the metal samples to the conclusion that Earth technology at this time could not produce them. Even though the elements of the alloy and the process by which they cling together retaining their own discreteness is a mystery. Gravity is of electromagnetic nature with two unitary but contrary forces. It works to attract as well as to repulse. It is connected to the mass itself. The Earth exercises the coherent and the second factor is itself the generation and use of what we call gravity. Gravity and electromagnetism exist at the same time and appear as attraction and repulsion. Different factors which were not elaborated on include the warmth of the planet and the coldness of the cosmos, the solid center of the planet and the atmosphere. These factors are important for the rise of the gravity and the anti-gravity. 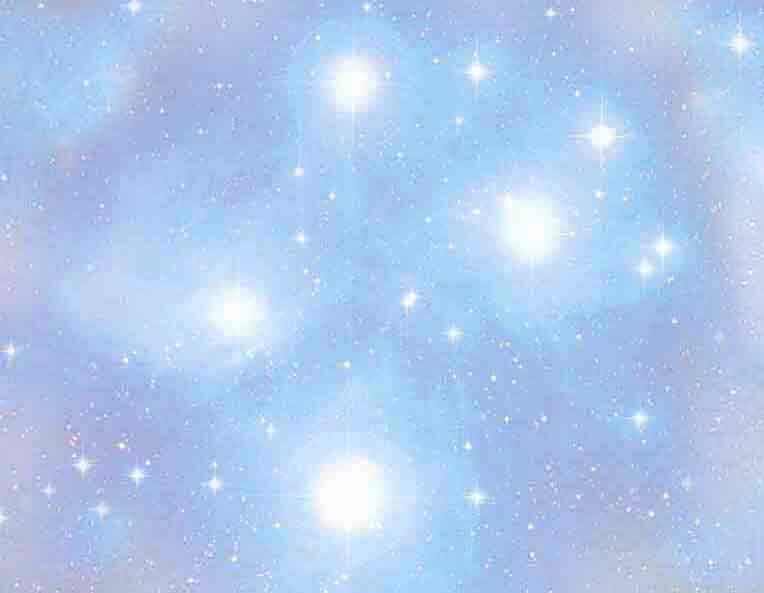 The Pleiadians have small tele-meter ships which are used to gather information about us. These ships are about nine feet in diameter and are controlled by radio type signal from their base. It can also be controlled manually by one passenger. The telemeter ships are used mostly to monitor all of our different languages. They study all of our languages and have on record all the languages that have been spoken on our world. A small telemeter ship was positioned over Billy's house for several years to defend him. On many occasions he was visited by extraterrestrials from other races, who not always had peaceful intentions. 1. 3.5meters. Crew of 1. Highly equipped. Used mostly to gather information. 3. 22.5meters. Special reconnaissance and carry a crew of seven. 4. 55 meters. Special mission ship. Can safely carry 20 to 40 people. 5. 120 meters. Cargo transport. Crew of 20. 6. 300 meters. Special purpose. 7. 700 meters. Special purpose. 8. 3000 meters. Special purpose. 9. 17,182 meters. A self contained world. We would call it a mother ship . Assembled in space. Fully self contained. Does not enter planetary atmosphere. Carries many smaller ships. 140,000 people live on board. 10. Unknown diameter. Very large for transport used to move large groups of people. Carries over one million life forms aboard. The technology for the wedding cake ship was downsized from the design for the largest and newest spacecraft built by the Pleiadians. A product of information provided by the Timers, this large galaxy-class ship measures 17,182 meters, or almost ten miles, in diameter. It was assembled in space and is not designed to be used in a planetary atmosphere. 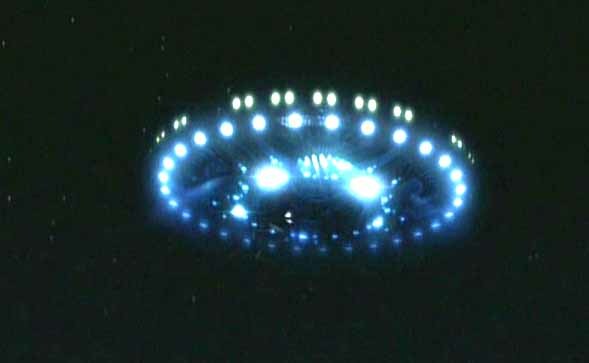 It represents a major breakthrough for the Pleiadians, for it is the first ship of its kind that can bridge the gap between universes. On Earth we would term this giant spacecraft a Mothership. 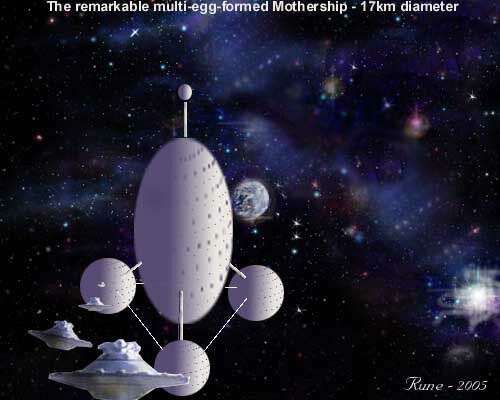 The main part of the ship looks like a large egg standing on end, while on the bottom there are three smaller, round sections that are interconnected by huge braces. The three smaller sections have another brace extending out of the top and hooking into the main part of the ship above them. One of the round objects provides a hatch, or hanger, where visitors can store their smaller craft while they are onboard the huge city. This is a completely self-contained world capable of providing a home for more than 140,000 people who live onboard. Most of these people enjoy living in space and very seldom return to the home planet. Everything is provided for here, including a large area constructed to duplicate the outside conditions found on a planet, such as gardens, lakes, and small mountains so that the inhabitants can commune with nature. Living quarters, schools, manufacturing facilities, virtually everything that is needed to sustain life is onboard, for the great ship has been designed to be a complete living situation for its crew and is completely self-sustaining. Since the population was so large, they designed huge airways that connected the different parts of the craft in order to move people around the ship. These airways run inside of the huge braces that hook the three smaller sections of the ship to the main body. This allows passengers to easily move from one area of the ship to another. The largest airway extends all the way up the middle of the main part of the craft. This giant open airway allows access to any level of the ship on small floating platforms that are used to move people up and down the airways and make it easy to get around. The air inside of the great Mothership contains not only a higher content of oxygen than on Earth, but other elements have also been added that reduce the need for sleep and keep the occupants awake longer. It is very similar to the atmosphere on their home planets. Along with the air, another consideration is the food. Just like on the surface world, the crew of this great ship eat a very light diet of vegetables and fruits. They have engineered the food so that by simply munching on small amounts of these specially grown fruits and vegetables, they can reduce the need for sleep to as little as only four hours per day, while hunger can be calmed for as long as 90 hours, if necessary.The Command Center for the great Mothership is located at the top of the main body of the ship and is where everything is controlled. have a way of projecting some kind of radiation beam at the ceiling so that you can see through it, causing it to appear invisible. This way everyone working at the Command Center can see exactly where they are and where they are going, not to mention that the view is spectacular. Visitors from many parts of the universe come together on this great craft, so communication would be a problem without the special language converters that are worn. It can read your mind and pick up your thoughts just before you speak. It then creates the words you need to say in the language you have selected, and causes you to speak it. When you normally learn a language, you practice for weeks and build your vocabulary and learn all the grammar. The converter already knows the language, so it only has to know what you want to say, and then it feeds your mind the knowledge of the language you have selected, and you can speak it. It contains the knowledge of thousands of different languages and allows good communication for the many different species that live and visit there. In the Command Center hundreds of Pleiadians and androids (robots with artificial intelligence) assist in the control of the ship. The androids are created organically by their scientists to do specific tasks. They do not have a spirit as humans do, but are programmed with tremendous intelligence to do certain functions. Most of the functions of running the ship are done by androids, since they are very well-suited for this kind of work. They can stay alive for long periods of time, are disease-free, and can be programmed for any kind of work, personality, and character. They are used extensively all throughout the Pleiadian society to handle most of the manual labor and technical work because they can be programmed with very advanced intelligence. The androids do not contain computers as we know them, but their brains would be an extension of the idea of a computer and are organically made from human material grown by their scientists. For spiritual reasons the Pleiadians do not believe in the idea of cloning, so they have instead advanced the concept of a computer into this level of technology. Being the latest in technology, the great ship can move in time, something that is not possible in most of the smaller Beamships. As explained earlier, the older Beamship breaks into hyperspace to move through the vast distances of space. Hyperspace can be utilized in different ways. When the small Beamship breaks into hyperspace, this is a form of time travel where time and space become paralyzed. A better way of saying it might be that time and space push against each other, causing a complete standstill of time and space. Just at that point, timelessness and spacelessness are passed by at immeasurable speeds in a part of a second, without any shift of time in the real world. In effect, this is time travel in stagnant time, whereby the Beamship appears at its destination at the same time it leaves its starting point. For a brief part of a second, it actually exists at its destination and its starting point at the same instant. This process is nothing more than a technically generated dematerialization and rematerialization process, where no time passes because of shifting or distortion. You could say that this is time travel without any time actually passing, because it happens outside of the timeframe of this coarcematter dimension. In a common time travel into the future, time and space are simply paralyzed and no time passes in the material realm, yet to move in the timeless and cause time to pass in the real world, other factors are necessary. When this is done, time is not paralyzed and there is a shift in the timeless. The ship and its passengers will move forward into the future, skipping through time that cannot be reclaimed. If it were possible to monitor this event on your watch, you would see that for every five seconds that pass in normal space, you would move one second forward into the timeless. This is made possible by regulating the time between dematerialization and rematerialization by the speed effect, for only in the timeless itself can the shift in time be controlled. The timeless can be broken down into a tremendous number of intervals which is beyond the complete understanding of the Pleiadians, but they know enough about it to manipulate it. For instance, a single second in the timeless is equal to millions of years in normal space. This means that if the ship would penetrate into the timeless and slow down or stop, they would move so far back in time that they would never again see their home worlds. Just the process of remaining for a few seconds with lowered speed in the timeless would cause many billions of years to pass on Earth. On the return to normal time, Earth would have evolved billions of years and would have disintegrated into dust, while the occupants of the ship would return to normal space and only be a few seconds older. This may all seem fantastic, but it is the way it works. Even the brightest Pleiadian scientists do not fully understand all of the complexities of time and space and are still puzzled by many inconceivable details. They have solved some of the problems and secrets of time and space, but continue to work towards a better understanding. The knowledge and necessary understanding of the technology for passing through the universe has been discovered, but they, too, are only at the first stages of development in these areas and have much to learn. Their current level of science, though, does allow for the possibility for travelers to step into the timeless and experience eternity. In a movie film shot by Billy we can see the phenomenon known as blinking. The ships seem to just become invisible to the eye and then re-appear. The movie film was been examined closely and nothing can be determined about how they do it. Billy says he notices a slight electrical feeling just as it happens. Also the film exposure seems to shift just a little. 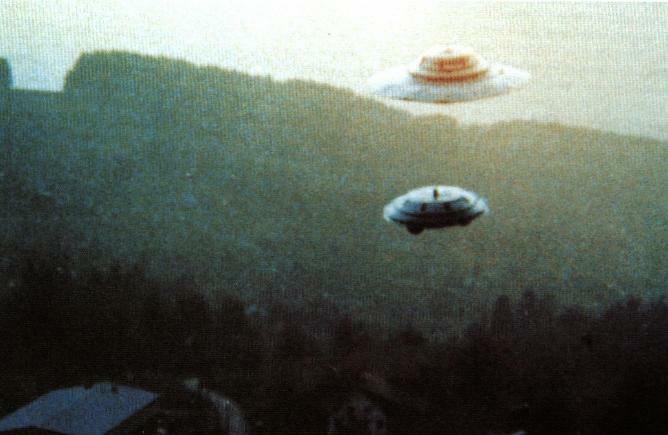 In other movie footage we can see the ship flying in a circle around a great fir tree over a house. At first it appears hung on a string because of the upward camera angle. However, close examination shows the ship actually moving over the top of the tree. In one section of the movie we see the ship moving left and right and then coming to a stop. Here we notice the ship seeming to wobble as it moves. It is explained that the ship is riding a wave of electromagnetism we call gravity. It appears to float on this wave much like a boat on water. The Pleiadians point out that gravity varies at different points on the Earth. Communication on the ships is by a process similar to our radio but the signal moves in a different way. The signal is attached to tachyons and moves through null-time so it arrives at its destination instantly. We have all watched Star Trek as the captain and crew are beamed down to a planet below from the transporter room. A very similar process is used to bring Billy up into the ship. He says he will receive a telepathic communication leading him to a contact site. He then will be taken up into the ship which is usually 100 meters or so overhead by a process that breaks his body down into atoms and then reassembles it inside the ship. The difficulty is in the fact that he must be of clear mind for this to work right. If he is full of negativity or anger he might not come back together right. For this reason they often beam him up without warning while he is working and clear of mind. It is considered safe to do this. Earthmen cannot go out into space with the war mentality!!! · Many races are waiting who would destroy us. · We are only protected as long as we cannot leave our Solar system.